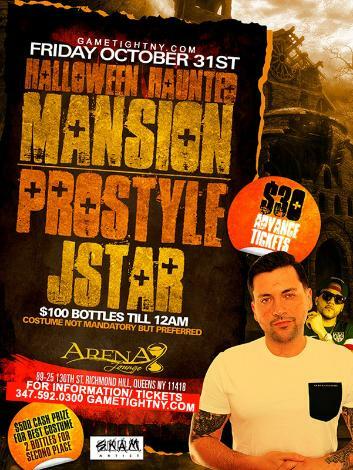 ARENA LOUNGE HALLOWEEN PARTY – RICHMOND HILL QUEENS NYC - HOTTEST HALLOWEEN QUEENS PARTY NYC WITH THE HOTTEST COSTUMES! $500 FOR BEST COSTUME & 2 BOTTLES TO SECOND PRIZE WINNER! MUSIC BY NYC HOTTEST DJS POWER 105.1 DJ PROSTYLE & DJ JSTAR & MORE AT ARENA LOUNGE IN QUEENS! HALLOWEEN IN QUEENS NYC PARTY ! TICKET EVENT 21 & OVER! HALLOWEEN PARTY @ARENA LOUNGE NY IN RICHMOND HILL QUEENS, NY! CAPACITY EXPECTED! BUY YOUR TICKETS NOW FOR JUST 30$! EARLY BIRD SPECIAL! Arena Lounge NYC Halloween Dress Code: Its Halloween – be creative! Arena Lounge NYC Halloween Bottle Packages: Bottle Prices available by request. RECAP OF LAST YEAR AT ARENA LOUNGE NYC!